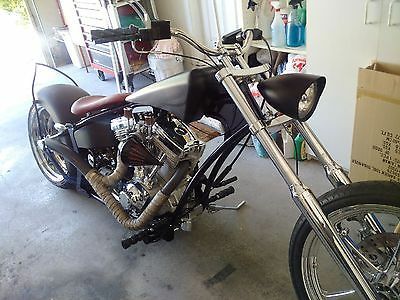 Custom Chopper Soft-Tail 250This Long and Very Clean Custom Chopper is a One of the Kind Beauty. 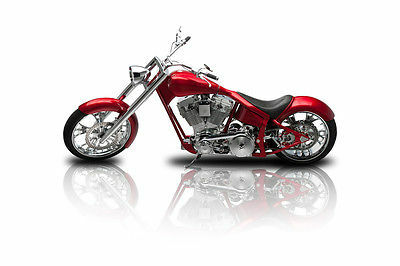 The 124" S&S Diamond-Cut Engine with 6 speed Transmission is giving this Bike Unbelievable Torque. Handling and balancing are Excellent due to the Right Hand Side Drive, Air-Ride System and 250 Rear Tire.This Chopper is loaded with plenty of Options, Chrome, Stainless Steel and only the Best Components.The Bike has been Designed to Function as Good as it Looks, from Hidden Lines, Matching Rotors, Pulleys and Wheels to the Oil Tank hidden in the Frame. Manuals and Diagrams are available. Only 2200 Miles. Accessories like Loading Ramp, Dust Cover, Lift, etc. Originally Invoiced for $87,000.00 Frame Custom Midwest Drop Seat, Soft Tail Down Tube Stretch +9 Backbone Stretch +6 Frame Molded with 2 Coat Paint, Black Metallic with red Flakes Curved Swing Arm Driver Seat Black Leather with Stitching, 1 1/4-inch padding Passenger Pad-On Seat, Black Leather with Sheep Skin Engine S&S Evo Style 124 CI Horsepower 129, Torque 137 Cylinders black Powder-Coat with Diamond Cut Finished Fins Gear Case and Cylinder Head Polished Air Cleaner Kodlin "Halebob", Chrome Mikuni Carburetor, Polished Exhaust Pipes 2.5”, Stainless Steel Twisted Custom Oil Temperature Gauge, Chrome; Drive Train 6 Speed with hydr. Clutch 3" open Belt with Covington BDL Chrome Cover "Tribal Style" Right Side 1.5" Belt Drive Drive Pulley Xtreme machine Psycho Rear Wheel Xtreme Machine, Psycho, Chrome with Avon Cobra 250/40x18 Front Wheel Xtreme Machine, Psycho, Chrome with Avon 90/90 x 21 Front Brakes HHI chrome with 2x4 Pistons, Xtreme Machine, Psycho 12" Rotor Rear Brakes HHI chrome with 4 Pistons, Xtreme Machine, Psycho 12" RH Rotor Suspension American Suspension, 22 Over, 63mm dia Tubes Legend Air Ride Rear Suspension, Height Adjustable Controls Custom Cycle Hand Controls with hydr. Clutch & adj. Throttle Control, Chrome Accutronix Tribal Handlebar Grips Accutronix Tribal Forward Controls Electrics Custom Wiring Harness, Color & Number Coded with Schematics Wiring Inside the Frame, All Hidden, Every Circuit Single Fused HD Braille Battery, 561 Amp Alternator 40 Amp with HD Rotor Electronic Ignition, Crane HI-4 Single Fire Dyna Twin Coils, 3.0 Ohm Single Fire Headlight, 2 x Euro-Components Cyclops, Chrome Theft Lock Device with Motion Sensor & Remote Control Cigarette Lighter, Chrome Only Serious Inquiries Please, Thank you for your Interest. 2017-01-28 22 2006 COAST TO COAST VIOLATOR PRO STREET 300 CHOPPER Original price was $38,000.00!! Look up NADA Value! Xtreme Kustom Paint Works Paint Job Custom Ice Blue Kandy Flake Paint Job with Escalade White Kandy Pearl and Subtle Tribal Graphics. 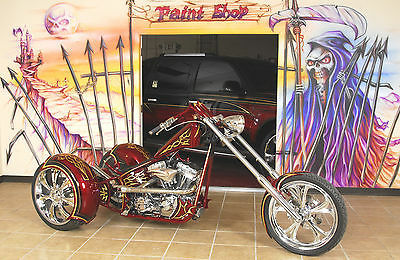 Rigid Frame Chopper, Powered by a Polished Patrick Racing 113ci Evo 1826cc. The engine alone cost $9,400.00. Baker Billet 6-speed Transmission, Eddie Trotta Chrome Air Breather, 44 mm Mikuni carburetor, BDL 3 inch Open Primary Drive w/ Chrome Bearing Support Housing, Exotic Choppers Exhaust Pipes, Chrome American Suspension Front End Weld Hot Wheel Aluminum Billet Chrome Wheels, Matching Pulley, Matching Chrome Brake Rotors, Chrome Front Disk Brake Caliper, Both Metzeler Tires are in NEW Condition, Massive 300mm Rear Tire.. mfg date code 0615 = Feb 2015, 21 inch Front Wheel.. mfg date code 4915 = Dec 2015, Custom Chrome Pullback Handle Bars, Performance Machine PM Contour Chrome Hand Controls and Grips, SS Braided Cables Throughout, PM Chrome Forward Foot Controls, Chrome Billet Foot Pegs, HHI rear brake, Chrome Bucket Headlight with visor, Custom Leather With Stingray Inlay Seat, Hidden Coil and Ignition Mount, Tormentor gas tank stretched into seat pocket on rear fender, Custom Cut Steel front and rear fenders, Chrome Shift Linkage, Rear fender hollow which houses the oil tank. Chrome Brake and Clutch Controls, Chrome Billet Side Mounted License Plate Frame, Awesome Looking Chopper,, BUT It rides so low there are many Paint Chips on the underside! 1 chip in the gas tank and 2 on the rear fender and several others on the frame, the chrome in several places is flaking, top of 1 rocker box, lower triple tree support, air intake, lower legs, hand controls,, Still Looks Good And is a lot of Bike for a Great Price, Professionally Maintained, Runs Perfect! The motorcycle listed is also for sale locally and I will end the auction for a realistic offer. BOTTOM LINE: IF YOU ARE A SERIOUS BUYER, PICK UP THE PHONE AND CALL ME WITH AN OFFER (561) 252.78OO Most of our auctions end with a phone call and reaching an agreement with a purchaser! Call Jim 561-252-7800 to make a Deal! All of My Photos are copyrighted! I Have Original Clean Title and it will be Transferred to the winner. It is preferred that you ask all questions before bidding as each bid is a contract to buy this vehicle. Local inspection on site is welcome with advance notice. 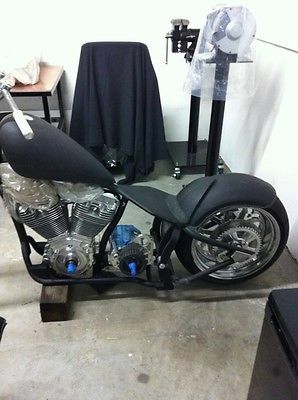 I Will show this Motorcycle in person! If you have ANY Question Please CALL me, there are MANY pictures Please look at All of them! TERMS: THE ONLY ACCEPTABLE PAYMENTS: High Bidder to PREPAY, in US Dollars, by Bank Wire Transfer, Money Order, Cashiers Check, personal/company check A Non-Refundable Paypal Deposit of $1,000.00 is due within 24 hrs. from end of auction. The balance via certified funds within seven days. I will ship the Motorcycle as soon as Payment Clears my Account (All forms of payment must clear prior to shipping) THIS AUCTION IS FOR SERIOUS BIDDERS ONLY. IF YOU DO NOT INTEND ON PAYING FOR THIS BIKE, PLEASE DO NOT BID. PLEASE CONTACT JIM BEFORE BIDDING IF YOU HAVE ANY QUESTIONS AT 561-252-7800 Please have all inspections completed and financing arranged prior to bidding. Pre-sale inspections are welcomed. Inspection companies are available on the internet as well as eBay. _____________________________ Option # 1 for Shipping or Pick Up This Motorcycle will be Picked Up or shipped from Palm Beach County, Florida, 33412. Paid for with Bank Wire Transfer, Money Order or Cashiers Check or in CASH within seven days after the close of this Auction, Funds must clear my Bank before delivery. Tag purchase and tax cost and arrangements will be the sole responsibility of the purchaser, upon request I will provide a temp tag for $20.00 Florida residents must pay sales tax, title and tag transfer fees. There are NO hidden Dealer or Extra charges. All out of state buyers are responsible for all state, county, city taxes and fees, as well as title/ registration fees in the state that it will be registered. ____________________________ Option # 2 for Shipping or Pick Up If Shipping is a necessity for you, the entire cost and arrangements will be the sole responsibility of the purchaser, I will however gladly help with arrangements. VIP Airport pickup in Palm Beach at the PBIA Airport can be arranged if you decide to fly in and pick up this Bike. Payment will have to be cleared at the Bank before pick up, This is Not negotiable. ______________________ This Bike can be shipped anywhere in the world I have shipped Vehicles to every state in the USA and Many countries worldwide, the ports I ship from are in Port of Palm Beach, Ft Lauderdale & Miami. The entire cost and arrangements for shipping will be the sole responsibility of the purchaser; I will however gladly help with arrangements and delivery to Port. _______________________ This Bike is advertised locally and I do reserve the right to end the auction if sold. Call me 561-252-7800 CERTIFIED POWERSPORTS & AUTO BROKERS INC in Florida For More information on this Super Clean Bike... See where we are Located and dont forget to View our Valued Customers Comments on the Testimonial Page! 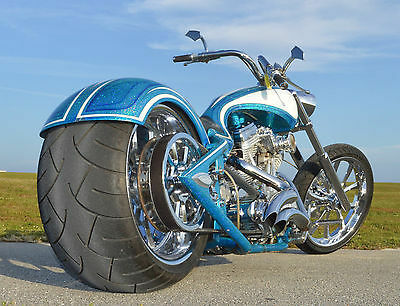 Custom Built Motorcycles : Chopper Special construction chopper rolling chassis. 21" front xtreme machine spade wheels with brake rotors. 18" rear 250 xtreme machine spade wheels with brake rotors. New S&S 124 engine. New 6 speed baker transmission. 6" up single down tube with a 4 inch stretch in the backbone. 38 Degree rake. Matt Hotch Pop up gas tank filler. 2006 Honda CBR600RR (CBR600RR), 2004 World Supersport - There's no tougher proving ground for a 600 cc sportbike than the AMA Formula Xtreme class, and considering the fact that one machine ? 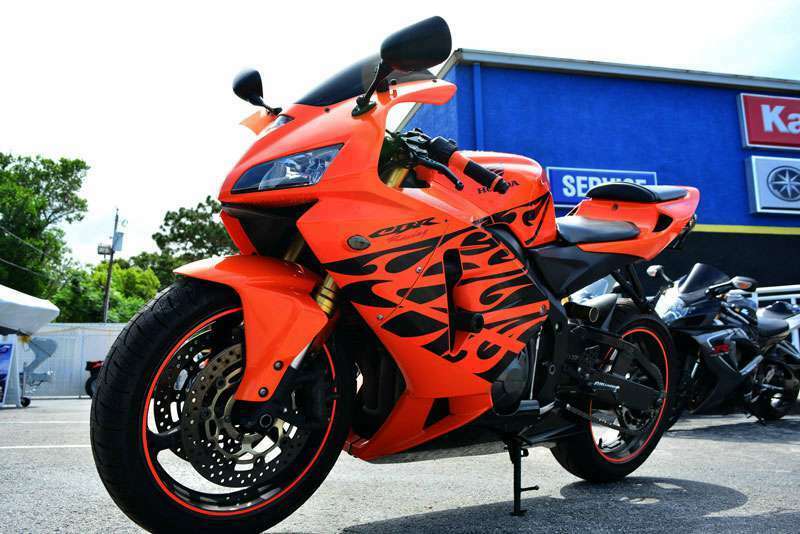 the CBR600RR ? has won every single race of the last two seasons, not to mention the 2004 World Supersport title and 2005 Daytona 200, need we say more? Well, other than this state-of-the-racing-art middleweight marvel simply has no equals. 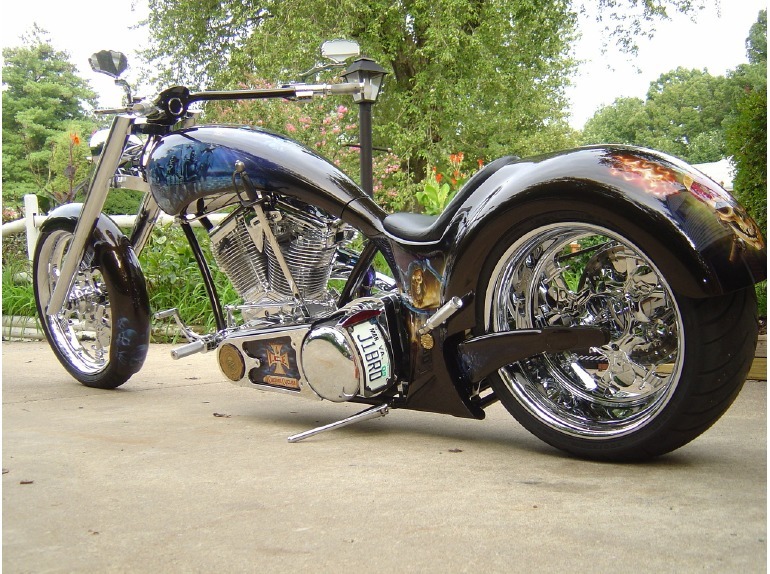 2005 Midwest Pro Street Custom Chopper. This custom chopper currently has 250 miles and in good condition- Custom Candy Tangerine color and with grey devil flames- Plus a premium black leather interior- S and S polished 124 Super Sidewinder- Baker 6 speed transmission system- Also equipped with Xtreme Machine wheels- Pulleys and brake Calipers newly installed- Kustomwerks mirrors and a Crane ignition system included- V Twin handelbars and risers- Hurst hand controls and a Hot Match pop up gas cap- American Suspensions 6 over inverted front end- PSFW 6 feet 2 inch down tube 42 degree rake frame- Vance and Hines Big Radius exhaust- 300 millimeter rear tire and right side drive- All welds filled moulded and sanded- Cycle has never been dropped and absolutely no leaks- This is a must see custom and everything within works well- Serious inquiries only. Qualified buyers may be eligible for Full Financing Nationwide Shipping and Extended Warranty. 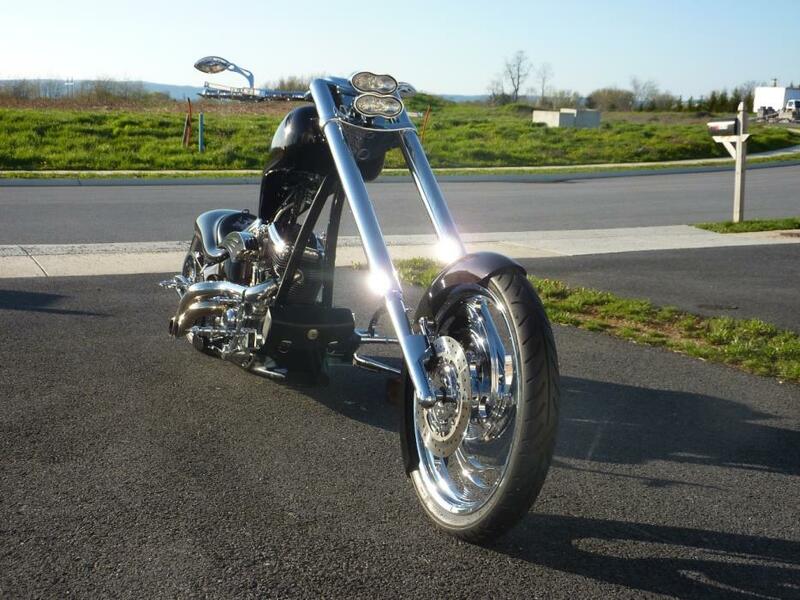 Custom Chopper - PRICED TO SELL - My loss is your gain... Built in 2004 by Track Customs – Denver, Colorado Drive Train: 100” RevTec Evo Motor (100+ HP) 6 Speed RevTec Transmission 3” BDL Open Primary Belt Drive Hot Match Radial Exhaust Pipes Custom Billet Ignition Housing Spike High Torque Starter Mikuni 42 Carburetor Frame: Xtreme Cycle Designs Soft Tail Frame - 7” Up, 3” Out, 38 Degree Rake Legend Air Bag Suspension Accutronix Forward Controls Performance Machine Front and Rear Calipers Russell Disc Brake Rotors Front End: Xtreme Cycle Designs Wide Glide Front End 36” Tubes Xtreme Cycle Design Billet Triple Trees 6 Degrees Chopper Inc. Whiskey Handlebars Accutronix 6” Risers Billet Concept Hand Controls ­Paint & Sheet Metal: Paint by Danger Graphics – Denver, Colorado Xtreme Cycle Designs Custom Gas Tank and Rear Fender West Coast Choppers Front Fender Wheels & Tires Hallcraft 80 Chrome Spoke Wheels Front - 21x2.15, 80 Rear - 18x8.5, 80 Metzler 90 Front Tire Metzler 240 Rear Tire Chopper has less than 200 miles on it. Original Owner VIN: 1X9MSO62830005008 Licensed, Titled and Registered in the State of Colorado I have receipts totaling more than $40,000 + for this build. Chopper has been is storage since 2006 Mechanical Disclosure: Leaking main crankshaft oil seal. Oil leaks out though open primary drive. Main crankshaft seals needs to be replaced. Sold “As-Is” Cash buyers no owner financing offeredIn-state (Colorado) pick up preferred. Can ship out of state for an additional fee and with cleared funds. Custom Chopper - PRICED TO SELL Built in 2004 by Track Customs – Denver, Colorado Drive Train: 100” RevTec Evo Motor (100+ HP) 6 Speed RevTec Transmission 3” BDL Open Primary Belt Drive Hot Match Radial Exhaust Pipes Custom Billet Ignition Housing Spike High Torque Starter Mikuni 42 Carburetor Frame: Xtreme Cycle Designs Soft Tail Frame - 7” Up, 3” Out, 38 Degree Rake Legend Air Bag Suspension Accutronix Forward Controls Performance Machine Front and Rear Calipers Russell Disc Brake Rotors Front End: Xtreme Cycle Designs Wide Glide Front End 36” Tubes Xtreme Cycle Design Billet Triple Trees 6 Degrees Chopper Inc. Whiskey Handlebars Accutronix 6” Risers Billet Concept Hand Controls ­Paint & Sheet Metal: Paint by Danger Graphics – Denver, Colorado Xtreme Cycle Designs Custom Gas Tank and Rear Fender West Coast Choppers Front Fender Wheels & Tires Hallcraft 80 Chrome Spoke Wheels Front - 21x2.15, 80 Rear - 18x8.5, 80 Metzler 90 Front Tire Metzler 240 Rear Tire Chopper has less than 200 miles on it. Original Owner VIN: 1X9MSO62830005008 Licensed, Titled and Registered in the State of Colorado I have receipts totaling more than $40,000 + for this build. Chopper has been is storage since 2006 Mechanical Disclosure: Severely leaking main crankshaft oil seal. Oil leaks out though open primary drive. Main crankshaft seals needs to be replaced. Sold “As-Is” Cash buyers no owner financing offeredIn-state (Colorado) pick up preferred. Can ship out of state for an additional fee and with cleared funds.